SHARE YOUR ROAD TO HANA STORY WITH THE WORLD! "The Road to Hana is truly one of the most exhilarating adventures you can experience while in Maui, especially if you can go in a convertible. I mean WHOA, talk about blessed if you have that opportunity! Everything in sight is visually stunning. It's a road that you and your fellow companions will bond on, and maybe even overcome some great fears, like jumping off waterfalls. The Road to Hana is one you will never forget. But if you go unguided and never even find a waterfall or anything besides the winding road for that matter, you may wish you could forget it! So make sure it's memorable for the best reasons; the incredible, once in a lifetime sights and destinations. Traveling with four kids isn't the easiest of ways to travel, but our journey on the Road to Hana was full of fun adventure and surprises. We stopped along the way to enjoy a hike complete with with surprise water falls and "Tarzan vines," which we tried out for fun. We enjoyed smoothies a long the way and a refreshing swim at Black Beach. The sights were amazing and the memories will last a lifetime. The Road to Hana CD was surprisingly entertaining and enjoyable, but most importantly, gave us tremendous advantage and insight into realms we would have easily missed otherwise. Thank you for making our journey so special. Brian, Christine, Megan, Alyssa, Andrew and Angelina. "Our journey to Hana was simply amazing. If other guides are the book version, then the R2H guide is the Oscar-winning-movie! The CD brought our adventure to life with epic music and an awesome storyteller. We quickly discovered the east side of Maui, specifically the Road to Hana, to be one of the most breathtaking places we’ve ever been. The route weaves you in and out of an intricate blend of lush rain-forests, romantic beaches, breath-taking waterfalls, and relentless views. Because of the guide, we were able to experience everything without being tied down to a tourist group but still get step by step details on where to stop, what to expect, and the history behind each location - and best of all, drive it at our own pace. Thanks to the R2H guide, we saw the Hawaii that we had always dreamed of and made memories on our trip that we will never forget. The Road to Hana is definitely an experience that you have to do yourself to understand and embrace, and all we can say is go do it! Now, every time we hear someone say Hawaii - our minds go right back to Hana." "We had a great time!! This is our second time traveling the R2H, and this guided tour showed us so many things that we had missed last time!! The R2H is an amazing adventure full of beauty and peace. It's an experience in your lifetime you do not want to miss. Very well done!!" The Road to Hana and Beyond was the ultimate adventure for us, and it was truly brought to life with the Road to Hana CDGuide and Map. It was great being able to download the online mp3sinstantly and simply hit the road! Through the storytelling and music, the guide led us through the exotic landscape that we couldn't have found on our own. The audio guide brought us to hidden romantic beaches, tropical trails that weaved through the jungle, and to a waterfall that you have to experience to believe (Waimoku Falls). The R2H and Beyond took us on a journey that was incredibly unique for the two of us, and gave us an experience that we will never forget! Riding bikes down a volcano at daybreak in a plastic jumpsuit resembling an Oompa Loompa? Way cooler in hindsight. Snorkeling with sea turtles? Also cool and well, very expected. Driving the Road to Hana in a Jeep, vowing only to partake of authentic snacks from roadside vendors while finding places only locals know...and essentially living out your own personal Indiana Jones adventure (complete with soundtrack) – we're gonna have to say it…PRICELESS! Maui was such an amazing island to visit and we easily filled every moment we had with activity. We all agree, however, that the day we spent exploring the Road to Hana – with only our Road to Hana CD to guide us – was the day we felt we truly began to scratch beyond the surface and dig down into the heart of what magical Maui had to offer. The CD was not only informative…it was entertaining and inspiring. We found ourselves skipping ahead in anticipation of the next scene we were being led to. If anything the CD was too short. WE WANT MORE! The Road to Hana (R2H) is more than 60 miles of highway, carved into the cliffs of one of the most beautiful rainforests in the world. Its curves hug the coastline of the blue Pacific, and its dramatic landscape will take your breath away... And that’s just if you stay in your car. The Road to Hana is located in eastern Maui and is full of the wonders of Hawaii you've always imagined. Whether your fantasies include frolicking in hidden waterfalls, driving through the exotic jungles of Hawaii in a Jeep Wrangler, hiking through a bamboo forest, or simply finding a secluded spot on the island to escape the fast pace of life, the R2H will indulge all your desires. There are multiple ways to experience the Road to Hana during your stay on Maui. You will want to devote at least 1 full day of your vacation to the R2H. 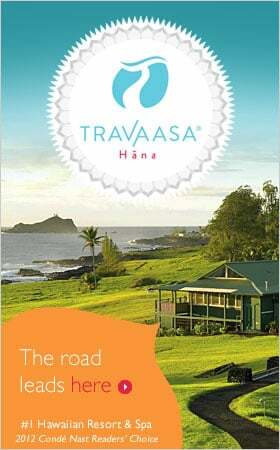 We have put together sample itineraries in our Road to Hana map for a 1 or 2-day experience. However, you could literally spend an entire day at some of these spots. The longer you can devote to the Road to Hana, the more you will get to explore the Hawaii you've always imagined.